it's the modern equivalent of the old campagnolo v shimano debate (no matter how often i add sram into that statement, it never seems to quite fit); to wear a helmet or not to wear a helmet? i do wear a helmet, but i have no desire to see it made compulsory for all cyclists. i tend to think of it in the same way as i pondered my car insurance when i was unlucky enough to own one; you pay the money each year, but hope you'll never have need to claim. thus wearing a helmet, and in this case, reviewing a helmet, will hopefully only include the physical fit and appearance, rather than any serious accident which might give cause to assess its head saving attributes. being hit by a volvo, mundell's truck or the service bus could conceivably leave the helmet unscathed, but demolish everything south of my ponytail. in such instances, and i have no real desire for any of them to come to pass, a cycle helmet is just a ventilated dod of polystyrene strapped round the chin. so why wear one in the first place? well, were it not for erratic sheep and cows, vast quantities of loose gravel, more potholes per square centimetre than any other region on earth, and an influx of summer drivers with no recognition of passing places, i'd be happy to ride wearing only a casquette du jour and a whiff of paul smith pour homme (of course jersey and shorts are sort of taken for granted in that last description). you can genuinely point the finger and accuse me of being overly cautious. as was mentioned during this morning's ride by an accomplice more used to trammelling mainland roads, traffic is particularly minimal over here, even considering it's the height of the summer. of course the minute that observation was made, we came across a stream of cars, but no nevermind, the pointed finger does not lie, and i am probably over-cautious. however, as pointed out above, i have no desire for helmet wearing to become compulsory, and thus dod of polystyrene or casquette and paul smith pour homme should be entirely at the discretion of the rider. rather obviously, that excludes professionals who have no option as to whether they fry on the ventoux or not, but then they've to wear what they're given and thus extraneous to this discussion. 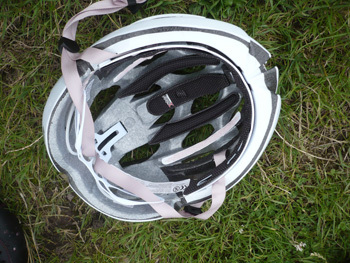 it may well be one of those old wives' tales, always assuming old wives find themselves concerned with cycling lore, but i had heard it said that helmets ought to be replaced every couple of years due to utlra violet degradation of the polystyrene. that could conceivably be one of those little white lies spread by helmet manufacturers, otherwise we'd buy one and be done with it, but on the premise that it may just be true, replacement has become just one of those things that has to be taken care of. a bit like new tyres every so often and a new chain at least every six months. in view of the helmet equivalent of threadbare afflicting my previous head case (no funny remarks please), it seemed only right and proper that i consider its replacement at this point in time. there's been a lot of utlra violet around lately. 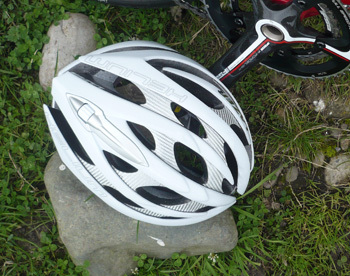 in much the same way as looking at fields and fields of carbon fibre at the cycle show, there is not a whole lot of variation in the world of cycle helmets, other than perhaps the price. convinced by my years of reviewing masses of different stuff that you get what you pay for in this life, i perhaps naively look at the top of the range, most expensive helmet in each range. this notwithstanding the well-known fact that when a new one joins the range, the previous one drops a few pounds/dollars in the catalogue. that could suggest profit margin rather than research and dvelopment, though one is not necessarily exclusive of the other. that, however, is my own viewpoint; your mileage may vary. in this case, consideration is directed at the lazer helium helmet, polystyrene which adorns the heads of the katusha team, though i will mention that i am not necessarily swayed by such as the 'lancewearsit school of thought. the helium sports a substantial number of cooling vents; perhaps the helmet equivalent of a gownless evening strap. one does indeed wonder why it is that the more it costs, the less you get in return. however, the fitting system employed on the lazer helium is worth the price of admission alone. fitted inside the vented polystyrene casing is the rollsys retention system: sort of a plastic endless strip connected to a thumbwheel sited on the top of the helmet at the back. thus, placing the helmet over an appropriate cycle cap, it's a simple task of rolling the wheel to tighten, or even adjust when riding. i can't be the only one whose brain gets bigger when riding my bike, can i? the padding is subtle, as in good, and i never noticed. comfort on hot days is acceptable, though i can't help noticing that my head seems a tad hotter than was the case with its predecessor. however, based on the fact that winter is a lot longer than summer over here, i'm happy to look upon this as a good thing, and the marked 295g seems easily the right side of negligible. all in all, the lazer helium is a stylish addition to both my cycling wardrobe and head protection, and one that i fervently hope will remain pristine until the ultra violet has had its wicked way, and i begin to consider other options in a couple of years' time. lazer heliums (helia? ), can be adorned in a variety of colours, including the aforementioned robbie mcewen version, though i haven't noticed any propensity to wheelie across the finish line while wearing. my last four helmets have all been white, and i could see no reason to break with tradition; call me boring if you like. sizing is remarkably simple, with three options: xxs-s/m-l/xl-xxl. i went for the middle of those, and the roof mounted thumbwheel is employed to fine-tune. with so many helmets on the market, and always the option not to bother at all, the subject could occupy thousands of pixels by way of discussion. oh wait, it already has.